To view sixteenth-century portraits currently for sale at Philip Mould & Co, please go to www.philipmould.com. 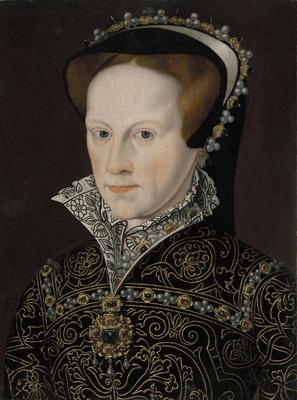 Mary I (1516-1558) was the first widely-recognised Queen regnant of England. Mary ascended the throne in 1553, in the wake of turmoil after the death of Edward VI, the last legitimate Tudor heir. The crown had first passed into the hands of a distant cousin, Lady Jane Grey, who was fated to reign for less than a week, before Mary was named Queen. The appointment was not without controversies however, as Mary had previously been made illegitimate by her Protestant younger brother, as she was a staunch Catholic, and would later go on to marry Philip II of Spain, in 1554. In spite of this adversity, Mary is remembered as a strong-willed and capable ruler, though her harsh treatment of Protestants led to the sobriquet ‘Bloody Mary’, by which she is often referred. Though in the month following her accession, Mary had promised her subjects that they would not be obliged to take up the Catholic faith, it soon became clear that Mary meant to impose Roman Catholicism on England, and several prominent Protestants including Thomas Cranmer and Hugh Latimer were immediately and publicly imprisoned on the Queen’s orders. By 1554, Mary had reconciled with Pope Julius III, and with the Heresy Acts revived, approximately 283 of Protestants were executed during the Marian Persecutions, largely by being burnt at the stake. The scale of the massacre has arguably been inflated by historians, given the brevity of Mary’s reign, and therefore perhaps she does not deserve her fearsome reputation. Further instability to the Crown followed when Mary suffered a phantom pregnancy in 1554, leaving her succession in jeopardy and putting a strain on her marriage to Philip II. Bad harvests and flooding plagued her short reign, leading to economic uncertainty. However, many historians assert that it was not Mary’s poor governance that led to these troubles, but rather that the short nature of her reign meant that Mary had little time to prove her strength as a ruler. Mary died in 1558, and was succeeded by her Protestant sister, Elizabeth I. Elizabeth and her council were keen to discredit Mary’s reign, and a great deal of anti-Marian propaganda was published following Mary’s death, such as John Knox’s The First Blast of the Trumpet against the Monstrous Regimen of Women, of 1558. Arguably it is the legacy of this kind of literature that has led to the common conception of Mary as an unjust and unpopular ruler, rather than the views of her own subjects. Indeed, many of Mary’s greatest accomplishments as ruler, including her economic reforms, naval expansion and investment in colonial exploration, were appropriated by Elizabeth as her own accomplishments, in the early part of her reign. This rare contemporary portrait of Mary is taken from a larger portrait by Antonis Mor, whose full length portrait of Mary I, of 1554, can be seen in the Prado Museum. The artist here has cropped the composition to include just the head and shoulders of the sitter. All extraneous detail has been removed from the background, creating a more modest portrait and enabling the viewer to engage fully with the direct gaze of the sitter. The monarch’s expression is composed, and the shading around her nose and mouth is softer than that seen in the original Mor work, in which her face appears quite stern. Particular attention has been paid to the ornate jewel around Mary’s neck, and to the embroidered decoration on her Medici collar. Dendrochronological analysis by Prof. Dr. Peter Klein of the oak panel on which this portrait is painted gives an earliest felling date for tree used of 1545, with a creation date of 1553 onwards. Given the clear political and religious break from Mary’s reign to Elizabeth’s in 1558, it is highly unlikely that a portrait of this quality of Mary would have been commissioned, much less displayed.